In 2014 alone, the total contribution of travel and tourism to the global economy was estimated to hit $7.58 trillion (both direct expenditures and corollary economic stimulation), with $2.36 trillion of that being a direct contribution due to money spent on travel itself, according to data from Statista. In the midst of this, the sustained spread of the internet in all its forms – both traditional and mobile – is shaking up the way companies interact with customers, and vice-versa. According to Statistic Brain, 148.3 million travel bookings are made online each year. While mobile is gaining traction, desktop-placed bookings are about 78% greater in number than those placed on mobile devices as of 2016, according to Statista. There are a lot of moving parts in travel bookings, so to speak, and every step in the process is important, especially at the beginning. A poor user experience due to web performance issues at the outset can lead to site- and booking- abandonment, and the companies with slow-loading sites are certainly losing a ton of money in the process. We wanted to examine the real-world experience of users accessing the top 50 global desktop travel sites as ranked by information technology company SimilarWeb, and examined the web performance of these sites to see what was going on with their web performance. This complements our mobile-focused last report, 2015 State of the Union: Mobile Performance of the Top Travel Industry Sites. According to our research, the travel industry is falling short of users’ expectations of their online experiences with these sites, with the vast majority loading key content outside of the critical three-second window, after which users will begin to abandon slow sites, according to multiple studies. While the full report contains a good deal of information, there are some key themes that emerged in analyzing the web performance of the top travel sites. •	Travel and hospitality sites had a median Time to Interact of 4.1 seconds, 1.1 seconds outside the three-second target. Every second counts! •	The sites generally also failed to cache static content, with 58% failing to do so. This causes the servers to have to fetch the data repeatedly when they otherwise wouldn’t have to. •	The median page size was 3.3 MBs, with 92 requests. That’s much larger than the average page on the internet, which weighs in at around 2.2 MB, according to HTTP Archive. •	26% of sites tested scored an “F” for image compression on WebPagetest.org, with just 6% earning an “A” grade. The median page tested had 92 requests – not svelte by any means. Of concern is the fact that 42% of the sites were loaded with more than 100 requests, topping out at 268 in one instance. Even if each request was only 50 milliseconds, when there are 200 of them, you’re looking at 10 seconds of load time. In reality, multiple requests tend to end up being several seconds each. The site of a major airline included in our testing had a Time to Interact of eight seconds, meaning it took that long for key feature content to be loaded and accessible to the user. That same site, with its 268 requests, had a total load time of over 17 seconds. While the number of requests was a huge factor, the fact that one of those requests took 11 seconds alone certainly played a role, as seen in the screenshot of a small section of that site’s content breakdown. Remember, requests add round trips to the server, and can add up to a wait that will likely exceed a user’s patience. Cut any that aren’t absolutely necessary. When sorted by the how long each request took to download, it’s obvious that JS requests weighed in quite a bit, with the biggest offender circled in red. The combination of the Time to First Byte and the actual content download means one of the limited browser connections was hogged for a good while. If users leave a site for being too slow, they certainly won’t be using any social media buttons included on the site they abandoned. When size is a problem, shrinking things down should be a no-brainer. It makes sense that travel sites would want to use big, beautiful images to help sell bookings. After all, you want to know where you’re going. But when the result is a bloated, slow website users are likely to abandon, were they worth it? 58% of the travel sites we tested scored an “F” rating from WebPagetest, with another 12% getting a “D” grade. One popular Chinese travel site ended up with a TTI of 7.7 seconds after un-optimized images took their toll. In this case, the image requests begin early in the loading sequence, with six large ones in a row taking up those connections. 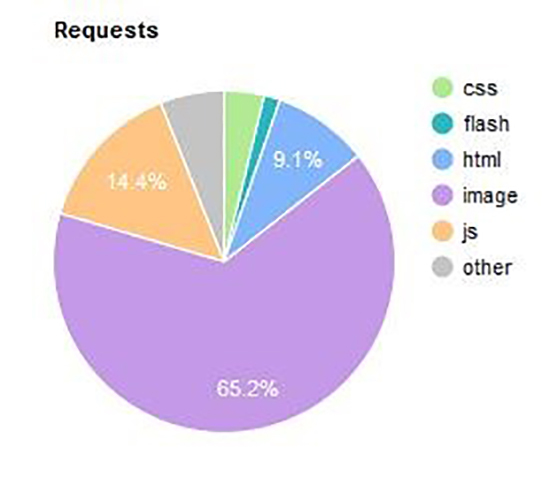 In total, this site had 86 image requests, out of a total 148 requests. An analysis of the images using the WebPagetest showed that the majority of them could be better optimized. In the example above, the image could be compressed to be over 45% smaller while still retaining a high level of quality. •	To minimize the amount of time required for images to be sent over the Internet or downloaded. •	To increase the number of images that can be stored in the browser cache, thereby improving page render time on repeat visits to the same page. Compressing image files lightens a web page’s overall payload. Fewer bytes mean reduced bandwidth and faster pages. Multiply these bandwidth savings by a large number of images, and you end up with a significant positive impact on load times. Skip it, and you end up with unviewed images. While these performance bottlenecks are worrisome and certainly have an impact on potential customers, they can be fixed. •	Customers accomplish their tasks more quickly and with less frustration. It’s a win-win scenario, and the travel industry can’t afford to leave money on the table by ignoring what can be fixed. For a list of web performance optimization tips and strategies, read our full report, which also covers the ecommerce, news and sports industries. Getting actionable information will set you on the right path, so you can set your customers on a road to new adventures. Previous PostJoin me June 13th on Facebook to talk about privacy.